2 years ago, we were looking at buying a used pop-up camper. No, we weren’t going to live in it…though we may just do that someday. I put almost nothing past us. We looked at older ones, and the price was right. 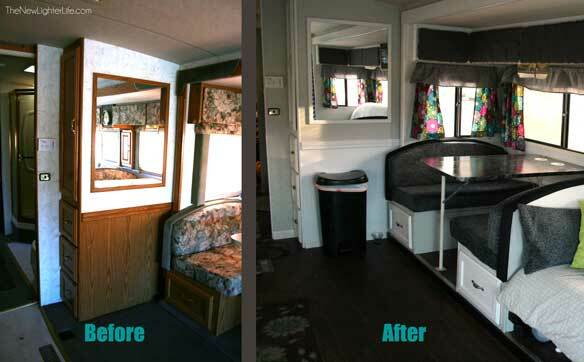 One thing we noticed about older pop-ups was that all the upholstery was ugly, nasty, or dirty. With zero hesitation, I told Mark that I could recover them. “It will be easy! !” He wasn’t sold. But I’m sure I told him over half a dozen times with the confidence of a lion, I could do it. We did end up getting a used pop-up but it was newer and the upholstery wasn’t anything either of us felt like we needed to change. Only this time, we both wanted it done. So I did what any person with zero experience recovering cushions would do. I bought a bunch of fabric without taking any measurements and set to deconstructing the existing cushions. -maybe you can see where I’m going here. I got about 1/32th through taking the cushion cover apart and I realized it was no fun. I also had to make 2 more trips to the fabric store to get the additional fabric that I needed after I actually measured the cushions. Here is the best before and after I have of the booth. 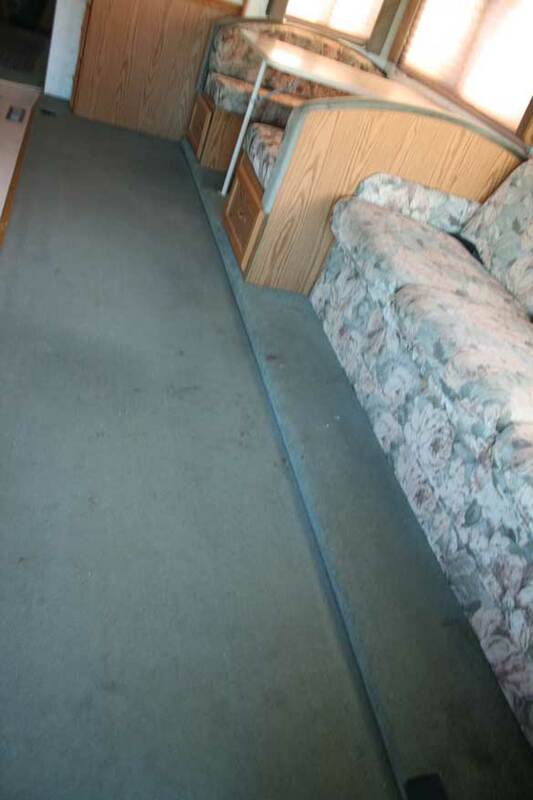 What a stinky picture, but I’m including it because you can most of the dinette in it. Now I’m going to tell you how I did it. 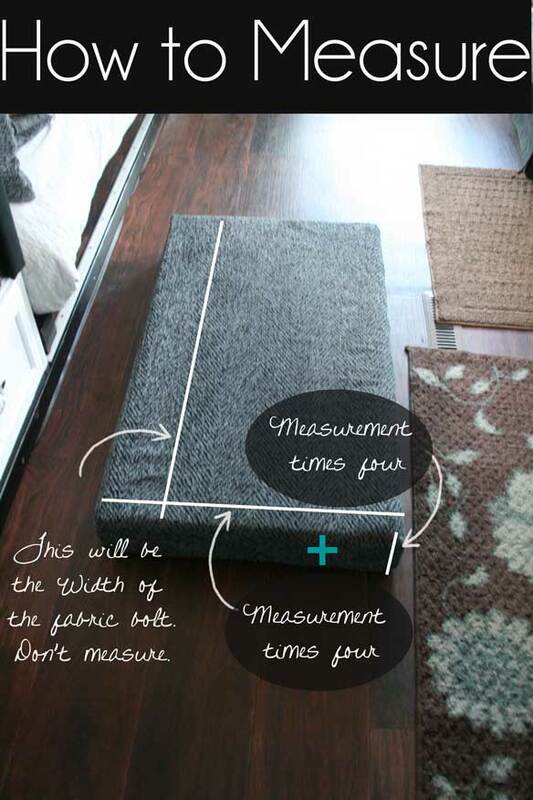 The first thing to do is measure the width of your cushion. I’m hard-headed which is why I did not do this right away. 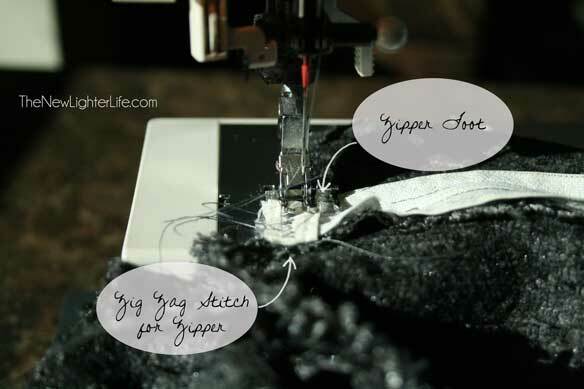 Save yourself the headache and extra trips to the fabric store. Measure. Just so you know, upholstery fabric comes in 54″ widths so it’s not necessary for you to measure the length of the cushion. A fabric bolt width will more than cover that length. 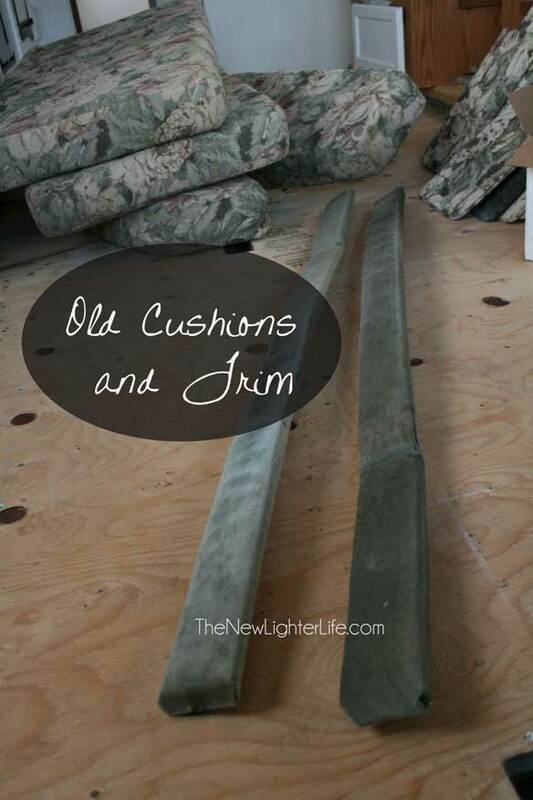 My cushion width measured 23 1/2″ for the seat part and 14″ for the widest portion of the back part. The depth of all the cushions was 4″. 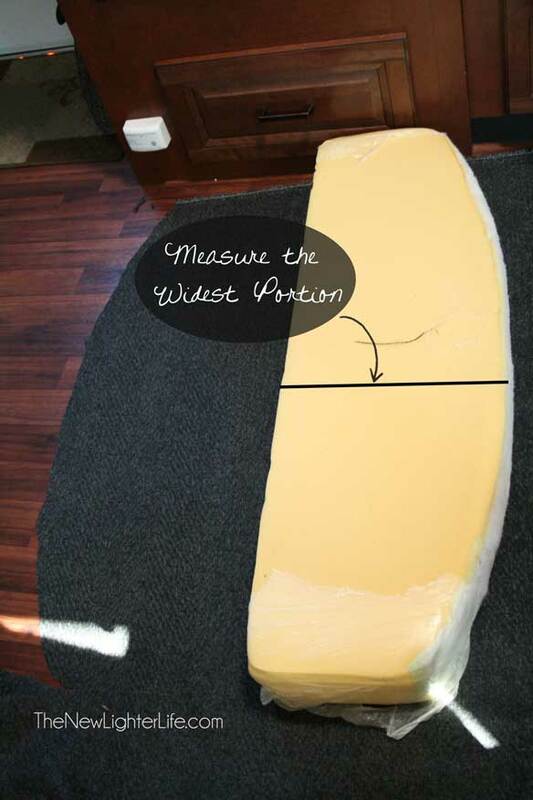 So here is a breakdown of the measurements of my cushion. You will multiply this by 2 for the two cushions. Next measurement to contend with is the end cap portions. If you have a directional patterned fabric like I did, you will need to get more yardage. My ends are 23 1/2″ X 4″ for the seat part and 9″ X 4″ for the back part. I had enough to piece the shorter back part end caps from leftover fabric. I needed to buy 4 more inches of the fabric for each seat end cap. 2 end caps were cut from one 4″ wide strip of the 54″ bolt. Now some of you seamstresses might be wondering what about my seam allowances. I found that if I wanted the cover to be snug and not loose, I needed to not cut for a seam allowance. I did sew a 1/4-inch seam instead of the standard 3/8th inch seam. So the total amount of fabric I needed for my particular booth was 186 inches. For safety sake, I’d round up to 6 yards. Now for cutting. I decided to use each cushion as a pattern piece. I laid the cushion down on the fabric and cut around it. 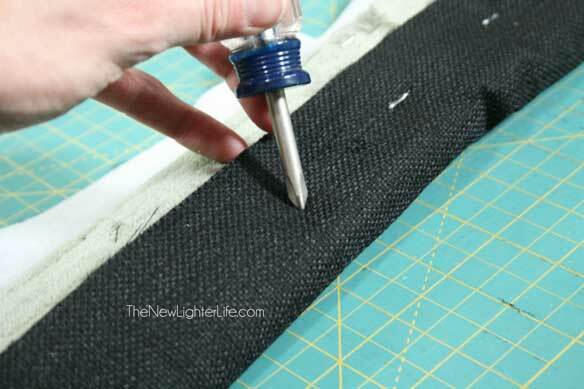 My fabric was dark but if you have a lighter fabric, you could trace around the cushion and then cut out your fabric. For the 4-inch widths, I cut them with my rotary cutter. Now you’re going to sew the pieces together. As I mentioned earlier, I used a 1/4″ seam allowance to have a snug fit. You can always make your seam wider if the cover is lose. Below is a diagram that will hopefully help you see what I did. The first is the back part of the dinette. Mine was curved and not as angular as the diagram. This is the seat part of the cushion. Same basic instructions as the one above. Just make sure you don’t sew them all together to make one continuous piece of fabric. 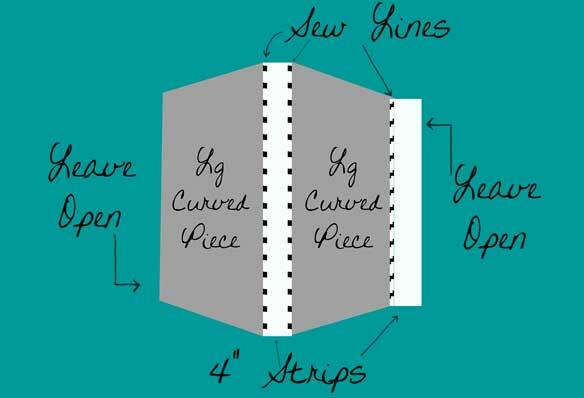 You need to leave the 2 end sides open, so you can put a zipper in. You are most definitely going to want to put a zipper in the cushion. Now don’t abandon me yet! Before this project, I had never sewn a zipper. Ever. I was actually pretty terrified of zippers. Irrational fears of zippers, that’s a new one. Because of my phobia, I tried to use velcro on one of the cushions. It didn’t work very well. I found that they puckered and were bunchy. I decided to repurpose the zippers that were on the orginal cushions. So I busted out my seam ripper and took them out. And true to my way of doing things I’ve never done before, I barrelled ahead without watching a single video or tutorial on how to install a zipper. If you’re the video DIY kinda person, here’s a great one for you to watch. As good as this video is, I found that some of her steps were unnecessary. I didn’t use tape. I didn’t baste anything. I just kinda winged it. I simply tucked the seam allowance under and top stitched the zipper on with my zipper foot. It worked great and I had no problems with it. You can see below, the right side of the fabric is on top and the seam is tucked under. I ran the zipper along and kept everthing aligned. But since I like variety, I switched it up. On another zipper I turned the zipper upside down and didn’t tuck under the seam allowance. Instead I sewed along the zipper and when fully open, the seam allowance and edge was clean and neat. Both ways worked wonderfully and I was very happy with the results. Basically, you should just know that I didn’t follow a bunch of fussy steps, it’s really so easy. And since I wasn’t sewing a dress, I think the zipper is pretty forgiving. One last thing about the upholstery zipper. 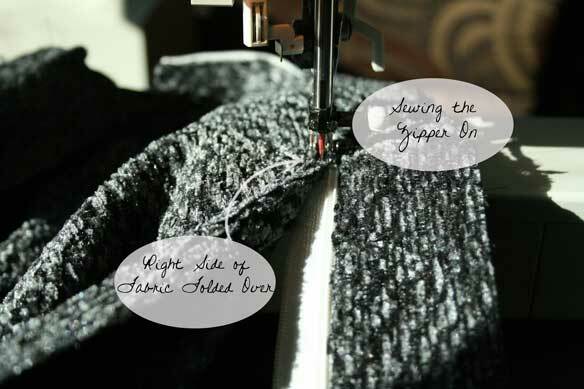 Mine had a fabric stop sewn in for both ends of the zipper instead of built-in metal stops. I had to zig zag stitch those fabric stops onto both ends of my zipper so that my pull didn’t slide off all the way or split open at the beginning. Yes, foolishly, I tried to do with out the stops. And here is a view of the completed zipper on one of the cushions. 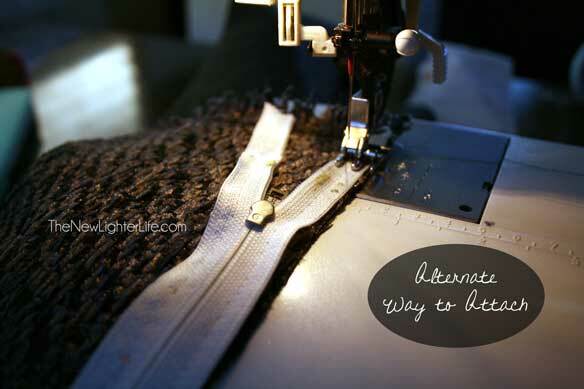 The last thing you need to sew on is your end cap pieces since you now have 4 large tubes with the zippers sewn in. Keep the tubes wrong side out and then pin them on with the right sides together. 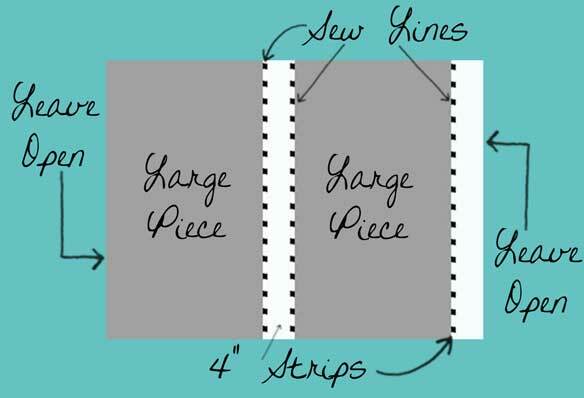 Simple sew all the way around the rectangular end caps to complete your cushion cover. Once you’re done, unzip them if needed and turn them right side out. Now just put your foam cushion inside each one of the covers and zip them up. If the fabric is a little loose, it’s no big deal. 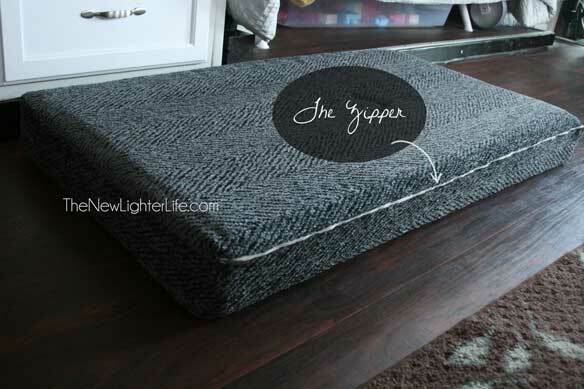 Just take the cushion cover off and sew a little wider seam throughout. The cushion is very forgiving on not-so-perfect sewing. 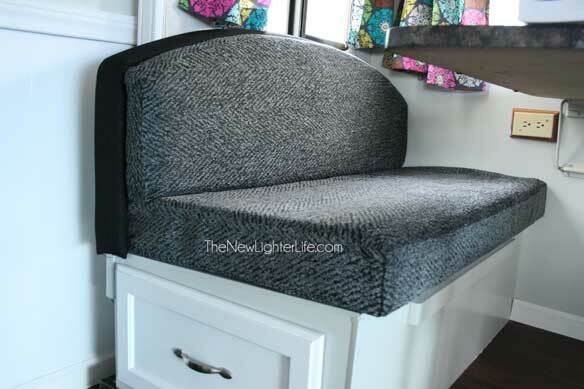 We decided to contrast our trim pieces with a black fabric. 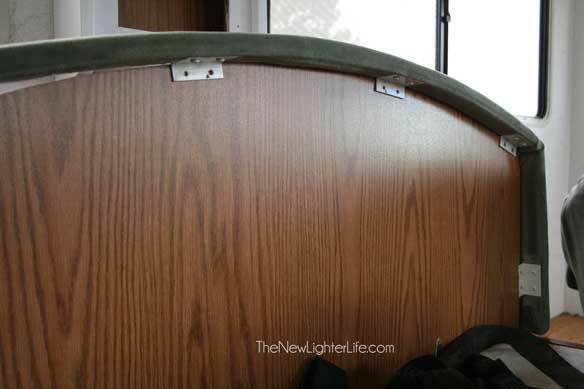 The trim needs to be unscrewed and recovered. I didn’t even bother taking off the old worn upholstery, I just laid the trim on the new fabric, cut and stapled it. As I went along I punctured holes where we would need to reattach the hardware for the actual bench. Here is a view of the hardware that is attached to the booth. We also painted the fake wood, table, & replaced the drawer pulls to finish off the dinette area. One final view of the finished project. I’ll just close by saying, that underneath my over-confident exterior, I was pretty nervous about doing this project. But if I can do it, you can do.